Thousands of Naga sadhu will reach Ayodhya to start Ramjanmabhoomi Temple on Ramnavmi. Thousands of Naga sadhu will March to Ayodhya to start Ram Janmabhoomi Temple on their own. VHP Dharma Sansad to declare Starting of Ayodhya Ramjanmabhoomi Temple on Ramnavmi dated on 14th April. Upananda Brahmachari | HENB | Kumbh Nagri Prayagraj | Jan 23, 2019:: Between the crucial dates of Ayodhya hearing fixed on 29 Jan in Supreme Court and the VHP controlled Dharma Sansad scheduled on 31 Jan – 1 Feb, the highest body of VHP and some top seers close to the organisation decided to place the date of Starting of Ayodhya Ramjanmabhoomi Temple Construction on the very date of Ramnavmi, the birth day of Lord Ram. Ramnavmi falls on 14th of April in this year. The tussle between BJP, Sangha Parivar and the Sadhu Samaj (the Hindu Saints, Seers and Akhadas) reaches in a critical condition when BJP in favour to wait for the SC verdict on Ayodhya land suit, the Sadhu Samaj is not ready to wait for BJP’s betrayal and politics on Ram Temple and VHP-Sangha Parivar are trying to reconcile the matter to stop the fragmentation of Hindu unity once built upon Ram Temple movement. VHP-Sangha Parivar is also facing now the blow of the Sadhu Samaj who are also finding their own retaliatory way to start Ram Temple denying hindrance put forth from Nagpur or Delhi anyway. The day after RSS General Secretary Bhaiya Ji Joshi delineated a picture to complete a magnificent Ram Temple within 2025+ before the next Purn Kumbh (the biggest Hindu congregation) again in Prayagraj, the majority of Hindu Akhadas (body of the Hindu sects of Saints) took it as a nasty Ram Mandir politics adopted by BJP. Top seer like Dwaraka Jyotishpeeth Shankaracharya Swami Swaroopananda Saraswati denounced the RSS-BJP’s Ram Mandir politics and announced his willingness to reach Ayodhya after Kumbha Mela for making Shilanyasa (laying foundation stone) as per Hindu scriptures to start construction of Ram Temple without taking any help of BJP or Congress as they would not be able to start any Temple for their ‘secular’ stand in politics. All India Akhada Parishad Chief Mahant Narendra Giri, who is believed to be the head of the most powerful association Hindu Sadhu-Sanyasi-Avdhut-Naga-&-Bairagis, expressed his utter displeasure on Ram Mandir politics by both Congress and BJP. Mahant Narendra Giri vowed ‘Marching to Ayodhya with Naga Sadhus after Kumbh Mela to start Ram Temple in the same way of 6th Dec 1992+ when Hindu retaliation smashed the Babri structure in to rubles.’ Giri categorically stated that ‘BJP govt has no intention to build Ram temple+.’ From various sources it is now confirmed that Sadhus will gather in Ayodhya after Kumbh Mela to start Ram Mandir construction+. Other Top Shankaracharya of Puri Govardhanpeeth, Swami Nischalananda Saraswati Dev Tirth urged speedy construction of Ram Temple in Ayodhya avoiding the increasing politics on it+. Jagatguru Swami Narendrananda Saraswati of famed Kashi Sumeru Peeth told in a Dharma Sabha in Prayagraj that VHP and RSS had no interest in construction of Ram Mandir in reality+. Feeling the Ram Mandir heat even the low temperature of Kumbh environ, the managers in VHP have decided to balance the fate of Modi govt in 2019 and the high urge of the Hindu society for Ayodhya Ram Temple through a a declaration of the “starting of Ram Janmabhoomi Temple on Ramnavmi next+” in the upcoming Dharma Sansad (31 Jan- 1 Feb), where thousands of Hindu Sadhus and leaders will assemble during Kumbh Mela in Praygraj. In the meanwhile Ex VHP president and Antarrashtriya Hindu Parishad (AHP) president Dr Pravin Togadia is likely to pay a one week visit and stay in Kumbh Mela in February. Dr Togadia already criticized the the anti-Hindu Role of Supreme Court and the ruling Govt in the Center and Uttar Pradesh who are not willing to start Ram Mandir in Ayodhya. In this pretext Dr Togadia is likely to form a new Hindu political party with its agenda to start Ram Temple within a week if it comes to power+. Earlier, he gave a call, “No Ram Temple – No Vote of Hindus”. In such a situation, the Supreme Court of India must not delay in ‘day to day hearing’ for Ayodhya matter and must not undermine the majority sentiment of Hindus on Ram Temple. The ruling party in the center must think the reactions and repurcassion of Hindu society if the party does not keep its promise to build Ram Mandir in a reasonable time frame. BJP must find solution for Ram Temple to avoid judicial and political truce+. Now, it is most significant that whether Hindu Sadhu Samaj and the Hindu society as a whole are determined to start Ayodhya Ramjanmabhoomi Mandir Construction to establish their claim, “Ram Janamabhoomi is the symbol of Hindu Ashmita (Hindu identity and pride) for Hindu empowerment and not a tool of election politics to capture the power only for party interest keeping Lord Ram in the exile under a tent”. Courtesy: The Links, pics, videos used above. 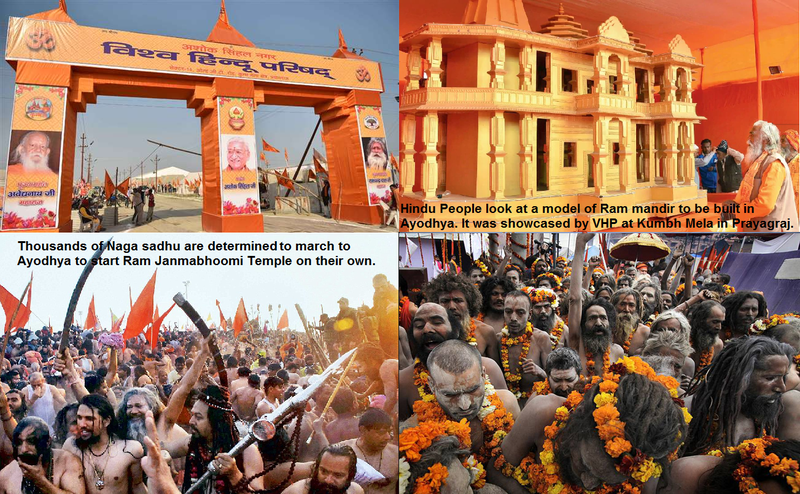 This entry was posted on January 23, 2019 by hinduexistence in Ayodhya Ram Janmabhoomi Temple Movement, BJP menace, BJP Menace on Hindu Matters, Demand for Ram Temple at Ayodhya, Hindu Advocacy, Hindu Agenda, Hindu Awareness, Hindu congregation, Hindu Demand, Hindu Demand for Ayodhya Ram Temple, Hindu Empowerment, Hindu Leadership, Hindu Pilgrimage, Hindu Politics, Hindu Retaliation, Hindu Saints, Hindu Unity, Hindu Vote Bank, Save Ayodhya and Ram Janambhoomi Temple and tagged All India Akhada Parishad, Ayodhya Ramjanmabhoomi Mandir Construction, BJP govt has no intention to build Ram temple, Dr Pravin Togadia, Mahant Narendra Giri, Naga sadhus will March to Ayodhya, RSS General Secretary Bhaiya Ji Joshi, start Ramjanmabhoomi Temple on Ramnavmi, Starting of Ayodhya Ramjanmabhoomi Temple on Ramnavmi, Swami Nischalananda Saraswati, Swami Swaroopananda Saraswati, Thousands of Naga sadhu in Kumbh Mela, VHP Dharma Sansad - Prayagraj 2019.